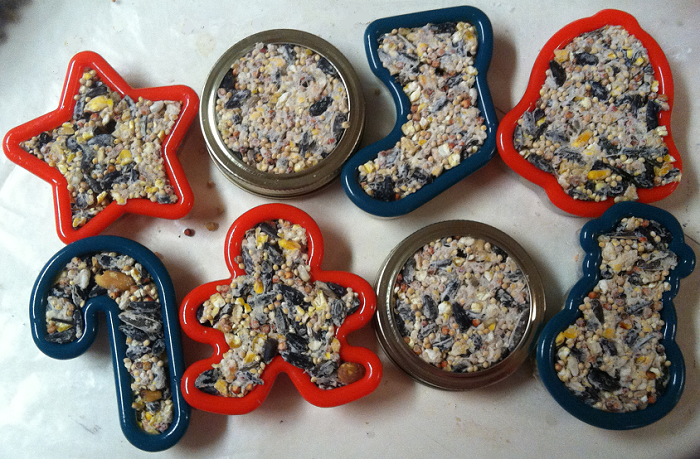 Owl Creek Gazette: Bird Seed Cookies! We first shared this Bird Seed Cookie recipe on our Owl Creek Gazette Members Only website back in November -- and now in the spirit of the season, we thought we'd share the recipe here as well. We're using these as ornaments on our own Christmas tree (as we're going with homemade/handmade ornaments this year) and then after Christmas, we'll take them outside for our feathered friends to enjoy. Here's a photo of our "cookies" drying -- tomorrow we'll pop them out of the cookie cutters and Mason jar lids and hang them on our tree! Spray your cookie cutters with non-stick spray to make the cookies easier to pop out. In a large bowl, mix together: ¾ cup of flour, ½ cup of water, 3 tablespoons corn syrup, 2 ½ teaspoon gelatin, and 4 cups of desired bird seed. Stir until the bird seed is evenly distributed. On a tray or sheet of wax paper, lay out your desired cookie cutters (sprayed with cooking spray). Fill the cookie cutters with the mixture and press into shape firmly. Make a small hole in each cookie with the skewer for the string.